Pollution prevention is a critical part of sustainable drainage systems and verified oil seperators are designed to protect the environment and prevent pollution of our rivers and streams by containing hydrocarbons (e.g. diesel, petrol or engine oil) that have entered a drainage network. There are statutory regulations in force to control the discharge of hydrocarbons, with severe penalties imposed for non compliance. The environment agency’s PPG3 guidelines are issued to enable you to comply fully with the current legislation on environmental protection. CubicM3 provide a range of oil separators that conform to both the Environment Agency’s latest PPG3 guidelines and European standard BSEN-858-1-2 and a re proven to separate oil and water. Class 1 – designed to achieve a concentration of less than 5mg/l of oil under standard test conditions. These separators are required for discharges to surface water drains and the water environment. Class 2 – designed to achieve a concentration of less than 100mg/l oil under standard test conditions and are suitable for dealing with discharges where a low quality requirement applies such as discharges to foul sewer. Both classes can be produced as Full Retention, Bypass or Forecourt Separators. GET IN TOUCH WITH OUR grp oil interceptor SALES TEAM NOW! Protect your downstream water courses by installing a SurfSep Screening unit. When installed upstream of any SUDs system, the SurfSep unit protects the receiving system from fine solids and debris that would otherwise accumulate overtime, rendering the SUDs non-operational. The Continuous Deflective Separation (CDS) technology was developed in Australia. The non-blocking screening technology has been independently validated by world-class research organisations - CSIRO (Commonwealth Scientific & Industrial Research Organisation), CRCCH (Co-operative Research Centre for Catchment Hydrology) & UCLA (University of California, Los Angeles). The CDS technology offers highly efficient separation of settleable solids (95% of all particles greater than 550microns) and achieves 100 percent capture of floatable material >1mm. Water and pollutants enter the system and are introduced tangentially inside the separation chamber forming a circular flow motion. Floatables and suspended solids are diverted to the slow moving centre of the flow. 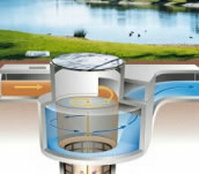 Negatively buoyant solids settle out to an undisturbed sump chamber below, while the water passes concurrently through the separation scheme. Floatables remain at the water surface and retained within the screen. Rapid Installation - comes with a self contained manhole that has BBA approval. Just connect inlet and outlet. 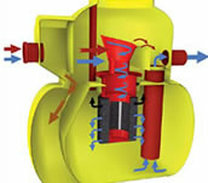 Non-Blocking - unique design takes advantage of indirect filtration and properly proportioned hydraulic forces that virtually makes the unit unblockable. Low Maintenance Costs - the unit has no moving parts and is fabricated of durable materials. High Flow Effectiveness - ​the technology remains highly effective across a broad spectrum of flow ranges. Assured Pollutant Capture - all materials captured are retained during high flow conditions. Neutrally buoyant particles are captured. Various independent field trials have shown that high levels of phosphates, heavy metals and hydrocarbons are removed from the flow.